In an unlikely turn of events, a third-party PS4 controller is shaping up to be one of the best PC controllers I've ever used. Earlier this week, I sat down with Head of Community and Influencer Marketing at Astro Gaming, Thadeous Cooper, to discuss the peripheral brand's latest controller for PC and PS4. Before letting me touch the gamepad itself, Cooper took a moment to remind of the company's rich history as an industrial design firm (Astro Studios) turned gaming hardware maker (Astro Gaming). Above all, he stressed its pedigree in the controller space. Astro Gaming isn't, and never was, just another manufacturer of shoddy third-party accessories meant for Player 2. In fact, early on in its conception, Microsoft collaborated with Astro to devise what would eventually become the Xbox 360 controller, arguably the best PC controller of its time. Sure, Astro helped concoct the console's chassis as well, but who wouldn't downplay their hand in the notorious Red Ring of Death? After the otherwise successful launch of the Xbox 360 in 2005, Astro went on to make professional grade gaming headsets, such as the universally celebrated A40 bloodline. However, as Cooper put it, the itch for crafting top-quality controllers, à la the Xbox 360 joypad, never quite subsided. Once the company had the bandwidth to return to its roots, the Astro C40 TR was born from creative, rather than commercial, longing. Supporting both wired and wireless modes, togglable via a red chrome switch to the left of the R1 and R2 buttons, it is a fantastic DualShock 4 alternative aimed at the burgeoning esports crowd. In wired mode, it uses a 6-foot rubberized microUSB cable, with prominent bezels on the connector end and a deeply seated port to prevent it from accidental mangling. It's no braided cable, but it'll do. Wireless aficionados, on the other hand, will have to settle for a 2.4GHz dongle. Sorry, Bluetooth fans, you're cancelled. 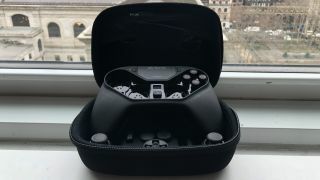 Firm but lightweight at 0.68 pounds, the controller draws influence from a more recent Microsoft creation, the Xbox Elite wireless controller. It has 14 buttons—15 if you count the touchpad—and features a standard DualShock 4 layout. In classic gamer fashion, it's black with red accents. Imprinted on the left handle are the initials "AG SF CA," as if to say "Designed by Astro Gaming in San Francisco, California." Off to the right is an official C40 emblem overlining the words "Tournament Ready," in case you were wondering what the TR stands for. One thing Cooper was keen to point out in our 45-minute discussion was Astro's dissatisfaction with the protruding battery case on the backside of the Xbox 360 controller. Looking at the C40 TR, you can tell it was an area of contention. Where the battery case used to live on the Xbox 360 controller is now an open canvas of blank space on the new controller. Below it, neighboring the grips on the controller, are a pair of rounded, rhombus-shaped buttons you can assign to any single control of your choosing. Astro calls these the Under Left and Under Right buttons, or UL and UR for short. Notice I said these are buttons, not the paddles we saw on the Xbox Elite. Unlike virtually everything else on the C40 TR, these buttons are not interchangeable. Between them is a small circular button. Pressing it lets you remap controls manually, absent the need to boot up the accompanying Astro C40 TR Configuration Software I'll get to in a bit. Above the UL and UR buttons are a couple of trigger stoppers. Sliding them up reduces the total travel distance of the R2 and L2 buttons by half. Especially in shooters, like The Division 2 and Borderlands 2, they're a nifty little perk. Of course, in racing games like Forza Horizon 4, you'll want to slide them back down, lest you face the harsh reality of driving without the luxury of gradual acceleration. Because it comes with a 23 x 2.5mm hex key, changing out parts on the Astro C40 TR is a quick and painless, but not exactly tool-less, process. While that may be disappointing to fans of the serviceable magnetic attachments on the Xbox Elite controller, to me, it's a reminder that not everyone needs the same level of customization from their controller. First and foremost, this one's for pro gamers, among which I am most definitely not. And as Cooper explained, like how avid runners have to buy new shoes every three to four months due to wear and tear, devoted esports players have to do the same with their controllers. Luckily, no matter where you stand, cracking open the faceplate on the Astro C40 TR is no difficult undertaking. Simply lefty loosey a quadrio of screws and it pops right off. From there, you can remove and replace six parts: both thumbsticks, the D-pad, and all three of their stem modules. In my own testing, I found this whole operation to take no more than a few seconds. With the faceplate removed, you can even put the D-pad in the left stick's place and vice versa, for a superior asymmetrical analog configuration. I will say it's strange you can't, or at least you're not supposed to, take out the face buttons. Our good friends Triangle, Circle, Cross, and Square are here to stay, and unless you're savvier than I am when it comes to hardware mods, you'll have to buy a whole new controller in the unfortunate event they stop working. As for components you can swap out, Astro plan on selling replacement sticks and modules, as well as upgraded sticks graced with longer stems, by the end of the month. Out of the box, the C40 TR packs in two short concave thumbsticks, two convex sticks of the same length, one long concave thumbstick, and one long convex one. The first time you plug the Astro C40 TR into your computer, you have to install the Astro C40 TR Configuration Software. Inside, you can update the firmware on both the controller and the included 2.4GHz wireless USB dongle. You can also remap buttons, create mapping profiles, edit existing profiles, modify stick and trigger sensitivity, and set your own EQ for audio streaming through the onboard 3.5mm headset jack. You know, standard controller fare. Opposite the wired/wireless switch is a profile toggle characterized by one dot on the left side and two on the other. Though you can create as many button mapping profiles as you'd like, hard coded assignments are limited to just two. In the bottom left-hand corner of the display, an Effects panel lets you adjust rumble intensity along with the brightness of the single, red-tinged LED light on the touchpad of the C40 TR. The downside is that, although you can control the brightness, you can only lower it to 20 percent. Clearly, Astro knows controller LEDs have their detractors. Why, then, not allow us to turn it off entirely? I smell a conspiracy brewing. Much as I love using the Astro C40 TR on my PC and my Shield TV at home, it's hard to ignore the lofty $200 price I'd have to shell out were I not a professional hardware reporter. For a career gamer looking to avoid buying a new controller every fiscal quarter, it's not a terrible value, especially since Cooper told me replacement modules are going to cost a mere 25 bucks a pop. That said, for the average player such as myself, the barrier of entry is three times the cost of the DualShock 4 and $50 more than the Xbox Elite. I can't personally justify spending that much on a controller whose biggest value proposition doesn't affect me. Yet, now that I've tried it, I don't want to go back.